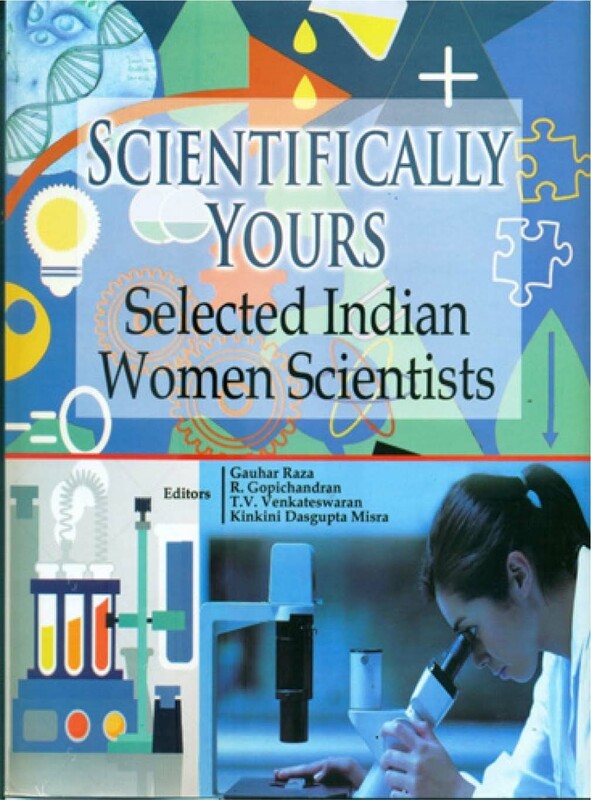 Scientifically Yours: Selected Indian Women Scientists1, edited by Gauhar Raza, R. Gopichandran, T.V. Venkateswaran, and Kinkini Dasgupta Misra. CSIR-NISCAIR and Vigyan Prasar, India, 2016, hardcover, 135 pages, ISBN: 9788174802842. This book is a collection of television interviews of selected women scientists of India, organized by CSIR-NISCAIR and Vigyan Prasar. The interviews were featured on the Rajya Sabha Television and also on the Doordarshan Bharati programme “Scientifically Yours” for showcasing contribution of Indian women scientists in their respective fields. The book contains thirteen chapters, where each chapter includes an interview with a woman scientist. This book celebrates a few of the best Indian scientists with primary emphasis upon their achievements, their struggle as women in mostly men-dominated scientific circle, and most importantly how they faced different challenges and succeeded subsequently. Best described by Indira Nath in her interview, “the obstacles are there for you to step over, not for them to obstruct you”. It is very evident that when these scientists were perusing their career goals, opportunities were very limited, the internet was not heard off, Indian society was still evolving, and most importantly it was not common for the families to let the girls study -leave alone imagine them assuming a leadership role in the scientific community. The majority of women scientists agreed that situation is much favorable today for girls to aspire and achieve their goals in any domain including the scientific research. This book is going to inspire millions of young girls. It breaks the dogma that says “there is any intellectual difference between men and women”. Thus the book leads to the conclusion that there is nothing in the scientific field which women can’t aspire for and achieve. The manner in which scientist Gauhar Raza has tried to bring in different facets of women scientists’ journey in their career through eloquent questions is worth appreciating. These key questions form the backbone of this book. Being a scientist, he has tried his best to bring up the issue of discrimination against women at different levels of life as well as during the professional career of which scientific field is no exception. There were many things similar among these living women scientists namely Indira Nath, Bimla Buti, Manju Sharma, Vibha Tandon, Sunita Saxena, Kasturi Datta, Chandrima Shaha, Rupamanjari Ghosh, Renu Khanna Chopra, Charusita Chakravarty (who died untimely in 2016), Chitra Sarkar, Shashi Wadhwa, and Riddhi Shah. First of all, almost all of them found encouragement and support from their family members without that they would not achieve the scientific excellence. Many had their parents as well as siblings as their role models at the same time many of them were supported by their in-laws in their career aspirations. Secondly, all of them had a passion for science, endurance to face any obstacle and eloquent capability of balancing their personal as well as professional life in a best possible manner. They all agreed to the fact that there were lesser women in their field when they had started their career. They had to struggle hard in a male dominated environment, where discrimination was part of the culture. This book helps us in understanding the fact that discrimination against women in the scientific community is not a regional phenomenon, rather, it is a global one. In fact, according to Indira Nath, this phenomenon started from the west where for women scientist getting recognition of her work initially was very tough. Since modern education in India came a bit late, as a result of which this notion was already changing, hence today more girls choose science in India as compared to the western countries. Vibha Tandon also accepted that the fact that in scientific field women are always underestimated and have to prove that they can do good science, have a capacity of thinking, can write grant proposals, guide research students, travel internationally alone and secure top positions. According to her though gender bias is decreasing, it still exists in the society. Regarding capabilities of women scientists, both Indira Nath and Renu Khanna Chopra accepted the fact that women are much better in handling teams and multitasking as it comes naturally to them. In fact, according to Kasturi Datta, female students are more conscious, organized and goal oriented. She also pointed to the fact that though today positive changes have been introduced, yet there is scope for more improvement. Regarding how the need to bring more female into science stream in India, Renu Khanna Chopra explained the need to bring women at the center stage of science and technology (S & T). According to her, there is a need for more government-supported S & T promotion schemes such as INSPIRE (Innovation in Science Pursuit for Inspired Research), and NCERT Science Talent Search scholarships through which brilliant girls can be identified and encouraged to take science as a career. According to Chand Rima Shaha (who became Director of the National Institute of Immunology, New Delhi), there is a need of sensitizing the society to encourage girls in taking up science as a career. Moreover, they should be provided support infrastructures so that they do not simply leave their education midway rather pursue their career goals. Although the situation in the country has been improving at the policy as well as societal level to encourage women for taking up science, there is the further scope for improvement in identifying their potential, nurturing and recognizing their work and most importantly making working environment friendlier for them. The book turns out an essential read for the young women scholars striving to become successful scientists. CSIR-NISCAIR. Scientifically Yours: A Programme on DD Bhart. 2015. Available on http://bit.ly/2kS2AY1 & http://bit.ly/2m4bvpF.